Mac users should be more than acquainted with PDFpen, the feature-packed PDF offering from Smile Software, that’s become a credible alternative to Adobe’s Acrobat PDF creation software. Now iPad owners can enjoy all that PDFpen has to offer on their devices as well. Smile, which is no stranger to iOS development having produced a mobile version of its TextExpander utility for the iPhone and iPad, has come out with PDFpen for the iPad. The $15 app isn’t the only PDF reader/editor app available for iOS—in fact, it’s a relative latecomer to the party, having been introduced at this year’s Macworld | iWorld event—but its seamless integration with the Mac version of PDFpen and its user-friendly interface help to justify its high price tag and make it a compelling alternative to rival offerings. 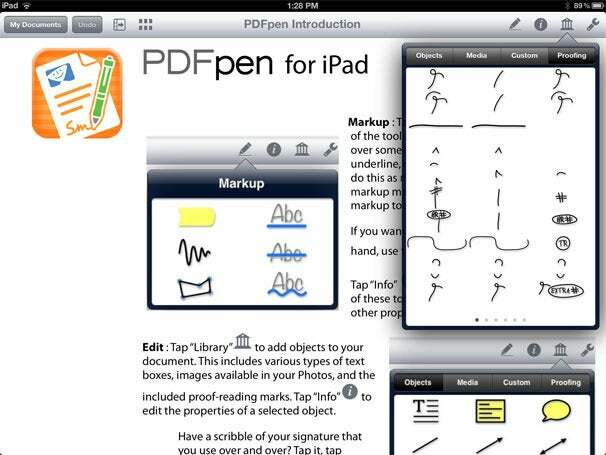 High Marks: A large library of proofreading symbols, pre-created objects, and other symbols you might use often with PDFs makes working with documents easy in PDFpen for iPad. You can move documents into (and out of) PDFpen in almost every way imaginable. You can do it old school via email attachment or syncing via Wi-Fi or iTunes. You can also download documents from WebDav or FTP servers, or you can connect to DropBox, Evernote, GoogleDocs, or iCloud. Using iCloud to sync documents between the Mac and iPad versions of PDFpen is super easy and, for me, is one of the biggest selling points of the app. Like most mobile apps in the PDF editing category, PDFpen lets you highlight, underline, and strikethrough text using an assortment colors. You can also draw connected lines and freeform shapes, which is a handy way of adding your signature to a PDF form. PDFpen’s library holds a variety of pre-created objects, such as lines, ovals, and squares, as well as text-oriented objects like text boxes and notes. You can work with images, either copied from another source or brought in via your iPad’s Photo library. There is also a large library of proofreading symbols available. Objects that you use most often—for example, items that you might use for filling out PDF forms, such as checkbox symbols, text boxes, or your signature—can be added to a custom area of the library where they can be accessed more quickly. Inserting elements from the library is as easy as tapping on them; however it takes some practice to move objects without resizing them accidentally. The feature I especially like has been borrowed from PDFpen’s desktop sibling—the ability to edit the original contents of a PDF. This generally works well, but it’s not a perfect process. For example, when moving images with shadows, I’m often able to move the shadow but not the main image. However, to be fair, the PDF format was originally designed to be a read-only medium, so it’s likely that such limitations are simply due to the nature of PDF documents in general. If you need assistance, help is available from within the app (in PDF format, of course) and there are excellent video tutorials produced by ScreenCastsOnline available on the developer’s website. For users of the desktop version of PDFpen who primarily work on PDFs between the Mac and the iPad, PDFpen for iPad is an obvious choice. Here’s hoping that Smile Software has an iPhone version in the works so that the app can be used on any iOS device.